Birthday Parties are more fun with a Cool Magic Show! A magic show should be a fun and exciting event that provides your child with lasting memories! ​A cool birthday party magic show features lots of interactive comedy magic and entertainment that makes the birthday person the star of the show! Watch as they help Magic Al perform some amazing magic tricks! Then get a special prize for doing such a fantastic job! During the birthday party show, a live dove will also magically appear! Then, after the show, the kids will get the opportunity to pet this wonderful gentle animal! It makes for an amazing photo opportunity! Our birthday party magic shows are available in Ontario for Belleville, Trenton, Brighton, Quinte West, Cobourg, Port Hope, Ajax, Oshawa, Whitby, Bowmanville and the surrounding areas. 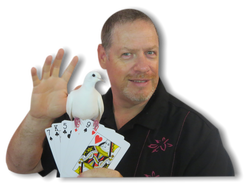 ​"Cool Magic Show did four shows at the Napanee Fair August 5 and August 7 , 2017. I received plenty of nice feedback about the performances. My Fair-Board companions ,as well ,were very satisfied and they are tough older audience. I took time to sit down and watch the show twice . I was pleased to see the variety from show to show as well as the cute and special interaction with the audience. Al captured the audience's attention from the start and held it to the very end. The next time we call on a magician to entertain at our Fair , Al will receive the first email. We certainly got our money's worth. I was very pleased!" - Barry R. - Napanee Fair Board. Magician available in Brighton, Belleville, Napanee, Trenton, Stirling, Deseronto, Cobourg, Port Hope, Whitby and Oshawa, Ontario.